It is a national journal published in the field of nursing, midwifery and health sciences by Health Sciences University Gaziosmanpaşa Taksim Education and Research Hospital, which is an educational and research hospital that does not aim for profit and has a strong gratification for its contribution to qualified scientific studies within the scope of its aims and social responsibility policies. Our aim is to create a qualified publication that both our academicians and health professionals will have the opportunity to share their knowledge and scientific studies by publishing and benefit from it as a resource. Journal of Academic Research in Nursing (JAREN) is a journal which covers such a research in all areas of nursing and health care. We are still working on to make our journal able to be included in international indexes such as PUBMED and SCI as soon as possible. All articles sent to our journal that have not been published elsewhere and have not been evaluated by the referees are first evaluated by the editorial board in terms of compliance with the publications policies of the journal. Appropriate articles are sent to two consultants for examination. The articles are evaluated within six months after receipt and transmitted to the editorial board. Accepted articles must be submitted within one month after the necessary corrections have been made. 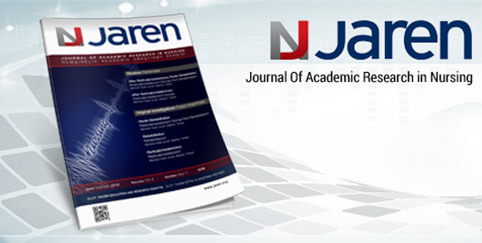 JAREN, a nationally recognized document of Journal of Academic Research in Nursing, is published three times a year in April, August and December. Taking into account the current debates, the editorial board will determine the issue of the file, which will guide the health sciences and health policies. The financing of the journal is provided by Gaziosmanpaşa Taksim Education and Research Hospital of the University of Health Sciences. It is published both in print and on the internet in order to provide readers with high quality images and easy access to the nurses / midwifes without any fee for the published articles. Our publication is a national journal published in both Turkish and English which is also open-access, independent and unbiased; based on double-blinded arbitration procedures. The submitted work should have a plain and high language quality and should be grammatically correct in Turkish or English. Also, it should be written in a clean and fluent language and should not include so many foreign words. JAREN has accepted the open access policy. Open access increases the global exchange of information and has beneficial consequences for humanity. 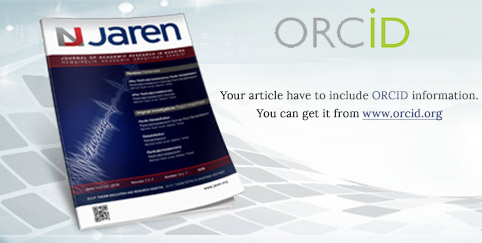 All articles published in JAREN are licensed under "Creative Commons Quote 4.0 International License". This license entitles duplicating, sharing and propagating in data mining applications, search engines, web sites, blogs and all the other platforms under the condition of providing reference to all the articles that are published, data sets, graphics and appendix. Open access is an approach that facilitates interdisciplinary communication and encourages different disciplines to work with each other. JAREN offers such a value to its field by offering more access and more transparent evaluation process to its articles in this direction. JAREN encourages libraries to include their journal content in library catalog records under an open access policy. JAREN's publisher, Health Sciences University Gaziosmanpaşa Taksim Education and Research Hospital, undertakes not to request subscription and fees for access to electronic articles published by any library or reader. There is no income source for JAREN article processing fee (evaluation fee or printing fee) and no subscription fee for accessing the articles. Full texts of the articles published in the journal can be accessed free of charge at www.jarengteah.org. (See Communication). Publication rights of all articles published or to be published in the journal belong to JAREN, the journal of Gaziosmanpaşa Taksim Education and Research Hospital of Health Sciences University. All or any part of the articles may not be published without the permission of the editorial board. Names and e-mail addresses in this journal site will be used for the purposes of this journal only. It will not be used for other purposes or for another part.